Power metal supergroup, AVANTASIA, who will take Sunday’s ‘special guest’ spot. A new “rock/metal opera” album is in the works, set for a late Spring 2013 release, and the Bloodstock set is one of only a few handpicked European festival appearances for the group next year. Knoxville deathcore crew, WHITECHAPEL are also joining the action. Their self-titled fourth album was released last June and the band spent the summer on the Mayhem Festival tour in the US alongside Slipknot, Slayer, Motorhead… and fellow Bloodstock-ers, Anthrax. Canadian death metallers,KATAKLYSM also step on to the BOA 2013 stage. “We played Bloodstock years ago and it was a crazy good time; we didn’t make it to England for our latest album, ‘Heaven’s Venom,’ so playing Bloodstock is the perfect gift to all our UK fans that have been pounding our doors to come back…” comments frontman, Maurizio Iacono. Maurizio Iacono also brings his own Roman-themed supergroup, EX DEO to the Bloodstock this year. The band features members of Martyr, Blackguard, and his other Kataklysm cohorts. The band’s second album, ‘Caligvla’, was released on 31st August 2012 – the 2000th birthday of Emperor Caligula. Bloodstock takes place at Catton Park in Derbyshire on 8-11th Aug 2013. 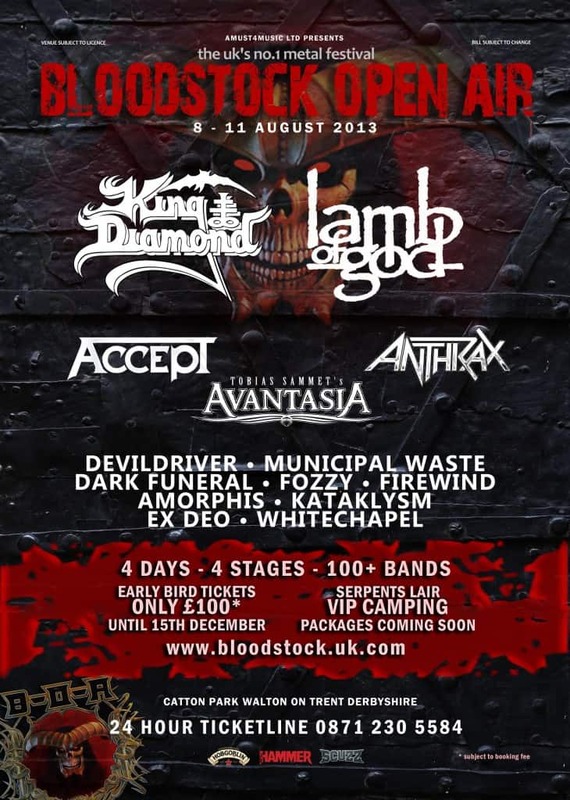 Check out further info on Bloodstock 2013 so far at www.bloodstock.uk.com.